We have from our own stock a Rare 1963 Jaguar E-Type Series 1 3.8 Roadster which are now becoming very scarce. 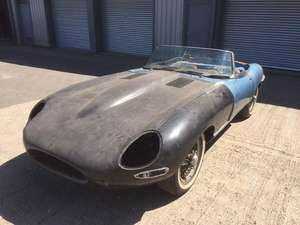 This car along with others was purchased from a Jaguar collector in the USA along with all his genuine spares that he had been collecting for over 40 years. This car was originally sold to Y Carey in the USA on 30.07.1963 and was supplied in the very attractive Opalescent Dark Green with a Beige Interior. The car comes with both the soft top frame and a hard top as per the photos, you will also see a photo of the boot which has many parts that are original and will be required for the restoration. When complete a 1963 Series 1 Roadster with Full matching numbers have been selling upwards of 200k, these cars tend to be a sound investment and a pleasure to own. 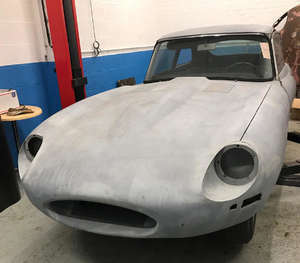 We have the USA Title, Nova Registration and the Jaguar Heritage Certificate which when you have completed the restoration will be required to register it under a UK number plate.